On a budget and looking to purchase a cooling mattress for a picky sleeper? The flippable Layla mattress, with its dual comfort levels and copper-infused memory foam, might just be perfect for your needs. What’s in a Layla Mattress? What Can Be Used with the Layla Mattress? What’s the Weight Capacity of the Layla Mattress? Does Layla Offer a Sleep Trial, Return Policy and Warranty? How Much Does the Layla Mattress Cost? Layla is a newer player in the e-commerce mattress-in-a-box game. Younger than already well-known brands like Casper and Leesa, Layla hit the ground running in 2016 and hasn’t stopped since. Most new mattress companies start with a flagship product offering a “one fits all” kind of firmness. The flippable Layla mattress goes above and beyond, with a different comfort level for each side. You get two choices for the price of one. Is this the real deal or is it a gimmick? Not counting crib mattresses, this is the first dual-sided one we’ve reviewed. We’re as curious as you are! Check out what we found out about the Layla mattress in the review below. The Layla mattress is made in the U.S., with the production and assembly steps spanning four locations. It’s the company’s belief that quality manufacturing comes from being directly involved in the process. Layla sources craftsmen and materials from all over America. It is flippable, meaning you can sleep on both sides. One surface is softer and the other is firmer. It contains copper-infused memory foam in the form of layers right beneath the cover. 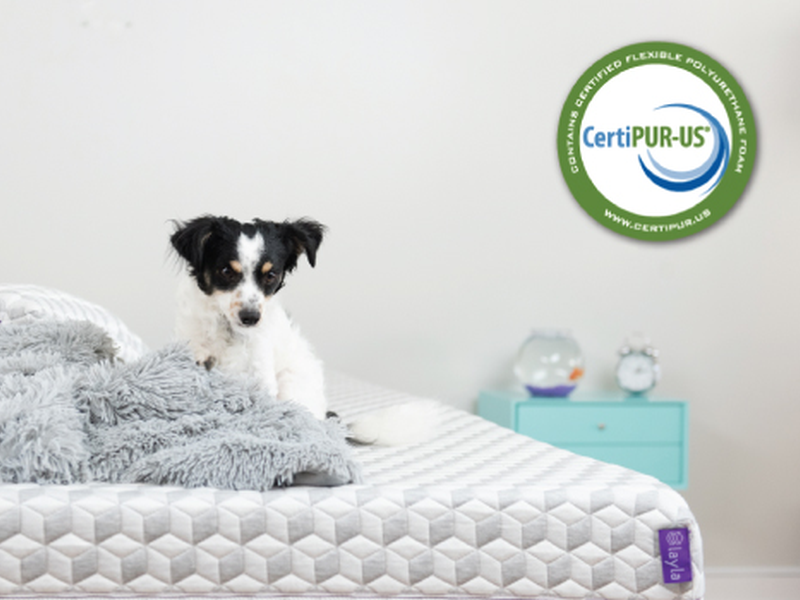 The CertiPUR-US approved foam layers come from California and Georgia. The cover fabric is woven and stitched in North Carolina—although when demand is high, they sometimes outsource the latter to Mexico and El Salvador. The final product is assembled and packaged in Arizona, and shipped from there, too. The zippered mattress cover is attractive and is designed to help with heat management, too! The fabric is a blend of polyester, polyester lycra, and viscose—plus thermoGEL, which is also woven in. It’s a food grade material that is supposed to activate and quickly cool you down when your body temperature rises. As we noted above, Layla uses thermoGEL as a cooling agent in their mattress covers. It works as you’re lying on the mattress. There are three different foams used to build the Layla Mattress: copper-infused memory foam, convoluted poly foam and high density poly foam. The construction is simple: four layers of foam, wrapped in a chemical-free fire sock, then encased in a removable mattress cover. Below is a detailed description of each layer, from top to bottom. 3 inches of copper-infused memory foam. This is closest to the soft side of the flippable mattress. The thickness allows for the hug and contour typical of memory foam. Why copper-infused? It aids in cooling and pressure relief, and is also antibacterial. Copper’s quick heat transfer helps people who sleep hot, and its deep compression support is great for side sleepers. 4.5 inches of high density poly foam. A firm and responsive base support foam layer helps to keep the shape and structural integrity of the mattress intact. 1 inch of copper-infused memory foam. This is the closest to the firm side of the flippable mattress, made of the same material. It’s not as thick, and doesn’t benefit from a transition layer before hitting the mattress core. This means that there’s a little less contour provided, and more of the high density poly foam’s firmness will be apparent. Can You Customize the Layla Mattress? 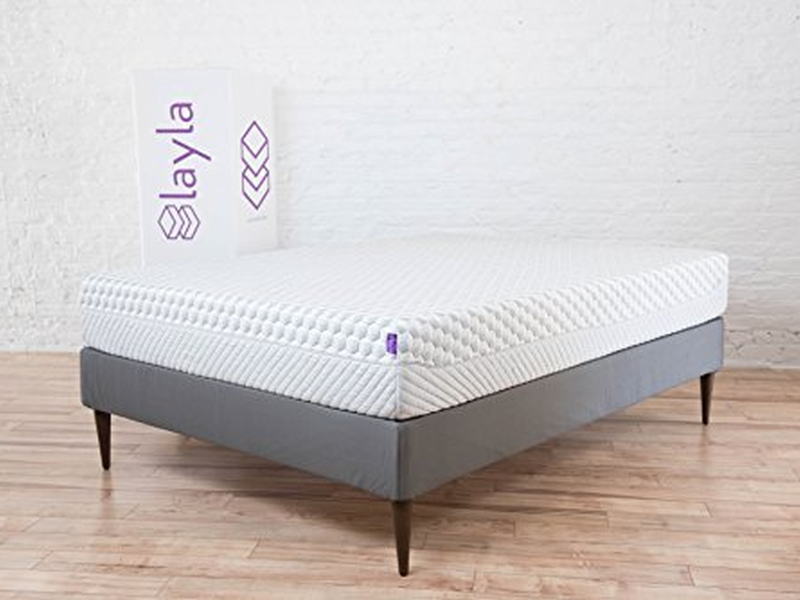 The Layla mattress is available in the usual six standard US sizes offered by bed-in-a-box startups: twin, twin XL, full, queen, king and California king. As with most of the brand’s competitors, this is all that you can really choose. No different cover, no specific comfort level, no custom thickness. Unlike most of the competition, though, you can test out both sides of the mattress to see which one you like better. Weight- and height-wise, the Layla mattress follows the industry average. It is a standard 10 inches thick. A queen size Layla mattress is 80 pounds, a little heavier than the 71-pound Casper or Leesa queen sizes. We’ll come right out and say it: The Layla mattress looks really good. From a visual standpoint, it’s very attractive. We especially love the monochrome and tiled cube-like pattern. The thickness and weight of the mattress may be industry average, but the look of this product is industry leading. As it’s not too heavy, it’s also ideal for people with not a lot of upper body strength. Note that Layla recommends rotating about once a month, though. Now for the parts we don’t like: Though pretty, the mattress cover is also the source of our frustrations. First of all, the mattress cover actually has a bottom that’s not made with the special fabric blend. It’s 100% polyester, and doesn’t have the special cooling properties of thermoGEL. If you want to flip the mattress and use the firmer side properly—it’s assembled softer side up—you will need to remove the cover, flip the mattress, and then put the cover back on. Why not just make the cover out of the proprietary fabric blend entirely, or at least offer it as a variant cover? We don’t get it. In addition to this, the mattress cover is dry clean-only. Layla’s customer service confirms that spot cleaning is okay as long as no moisture gets onto the foam. Our advice: Remove the cover, spot clean, and then dry completely before zipping it back on. Layla also sells replacement mattress covers. Almost any surface or frame can be used with the Layla mattress. Any box spring, foundation or solid platform will work well. As it’s a foam mattress, it’s also ideal for an adjustable base. Layla notes that a bunkie board between the mattress and the bed can be used, but it may restrict air flow. A slatted base with slats offers the best in terms of air flow—which will aid cooling—but slats need to be no more than three inches apart. Otherwise, the mattress may start to sag and the warranty may be voided. To ensure warranty conditions, you may want to go with the Layla foundation for a perfect fit. You can find it on Layla’s official website. Loving the copper-infused feel? You may also want to try out the Layla pillow (Check deal on Amazon), which uses the same cooling technology. How Do You Set Up the Layla Mattress? No fancy options here. Unlike some competitors, Layla doesn’t seem to have a white glove delivery or assisted old mattress removal option for an additional fee. They do it the old fashioned, direct e-commerce way: delivered straight to your doorstep in a box. It’s not very heavy, so you won’t have as much trouble moving the mattress around (as you may find with, for example, a GhostBed Luxe or a Leesa Sapira). You can test out both sides before settling on the one you like, adjust it accordingly, and then arrange it on top of your bed surface. Remember that you need to unzip the cover to flip the Layla mattress properly. As it’s a foam product, it will off-gas, though of course emissions will be low as certified by CertiPUR. This new mattress smell will dissipate more quickly with better ventilation, so placing the mattress near a door or window will help. Doing this will also prevent that odor from hanging around your actual sleeping area. To unroll, carefully take off the plastic packaging. You will notice that the mattress will expand right away. Full decompression happens in minutes, according to Layla. You can sleep on it right away. The weight capacity of the Layla Mattress varies with the mattress size. We looked for this tidbit of information for a while, but couldn’t find it listed anywhere! Thankfully, Layla’s customer service was very helpful. Twin through full sizes can support up to 500 pounds in total. Queen through California king sizes can support up to approximately 800 pounds! Worth remembering, though, that the mattress is only 10 inches thick. For very heavy people, thicker mattresses are usually more comfortable—at least in our experience. How Does the Layla Mattress Feel? We’ve looked through hundreds of customer reviews, and this is a most difficult question to answer. For one, there are two comfort levels! The whole point of the Layla mattress design is for the sleeper to have two choices. We will say this, though: Many people point out that the two sides are closer in feel than they thought they would be. It’s not so much soft or firm, as much as it is medium soft and medium firm. As usual, there were the typical “Goldilocks” complaints. There’s a smattering of complaints that are just variations of “firm side too soft” or “soft side too firm”. Interestingly, though, a very small number of people have complained that the soft side becomes too soft over time. Pressure relief is said to be great, especially on the softer side, which makes it great for side sleepers. Motion transfer is very low, too. This makes it a great mattress for couples, particularly if one is an active sleeper. As we’ve mentioned above, the design of the Layla mattress is also very much focused on cooling. If you sleep hot, you will find this a budget alternative to pricier cooling mattress options. As a new brand, there isn’t a lot of expectation tacked on to Layla. However, in the amount of customer reviews we went through, there were hardly any complaints about the company and its customer service. On the contrary, even some of the negative feedback had additional comments praising the company itself. How Is Layla’s Customer Support? Layla’s FAQ is not extensive, but it is sufficient. We also appreciate the fact that they display reviews and customer Q&A directly on the Layla mattress product page. There’s also a live chat option, and while it’s not on 24/7, when it is the customer support representative is helpful but not pushy. No upselling, which is a big plus for us. A telephone hotline is also available if you want to talk directly to a support rep. You can even follow Layla on Facebook, Instagram and Twitter. Their blog section is also well-populated and informative. The Layla mattress comes with a 120-night sleep trial, a risk-free return policy, and a lifetime warranty. The sleep trial period starts the day you receive the Layla mattress—not when it’s shipped. We love that! Layla asks that you sleep on the mattress for at least 14 days, though, before deciding if you want it or not. It’s not truly a “no questions asked” return policy, as you also have to provide a reason when you initiate the return. However, Layla does give you a 100% refund. Returned mattresses will be donated to people that need them, and in most cases will be picked up as is by a local charity. The lifetime warranty covers extreme sagging, mattress deformity, foam cracking, and more. You can read the full conditions on Layla’s official website. Note that many mattress experts and sleep specialists do recommend changing mattresses every ten years, so this warranty is good but not as amazing as it sounds. As of this writing, the queen-sized Layla mattress is $799 on both the official website and on Amazon. This is a steal for a cooling memory foam mattress with an above average sleep trial period! That there’s free shipping to the lower 48 US states doesn’t hurt, either. We love everything that’s good about this mattress: the cooling aspect, the dual sides with different comfort levels, and even its average height and weight. It’s comfortable and ideal for side sleepers, for people who sleep hot, for active sleepers who don’t want to interrupt their partner’s sleep, and—if the weight limit can be believed—for heavier people. We have minor qualms about the mattress cover design. 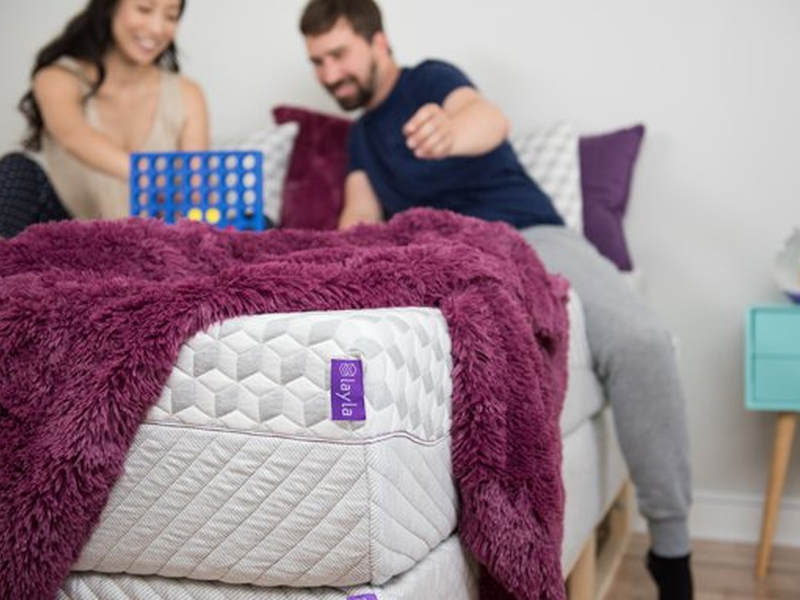 We don’t understand why Layla would make a flippable mattress with a cover you’d need to adjust every single time you decide to flip and change sleeping surfaces! But this doesn’t affect the end use of the product—we’ll concede to that. Overall, Layla offers an attractive mattress for an attractive price. With the sleep trial and the return policy, there’s every reason to try the Layla mattress out. Who knows? One side may be the perfect fit for you.